New to the 2018-2019 season, Gryphon Football is introducing an Honourary Captain for each of our home games. This Honourary Captain is picked from our collection of distinguished Gryphon alumni and is someone who represents all that Gryphon Football is. The Honourary Captain becomes our VIP for the game and will join our captains on the field with the referee to do the coin toss. For our last game of the regular season, and the day after his induction into the Order of the Gryphon for his generous donations to our team, it was our pleasure to welcome Don Taylor back to the Alumni Stadium turf to be our Honourary Captain for a crucial game against Waterloo. Don wore the Redmen jersey from 1959-1964. 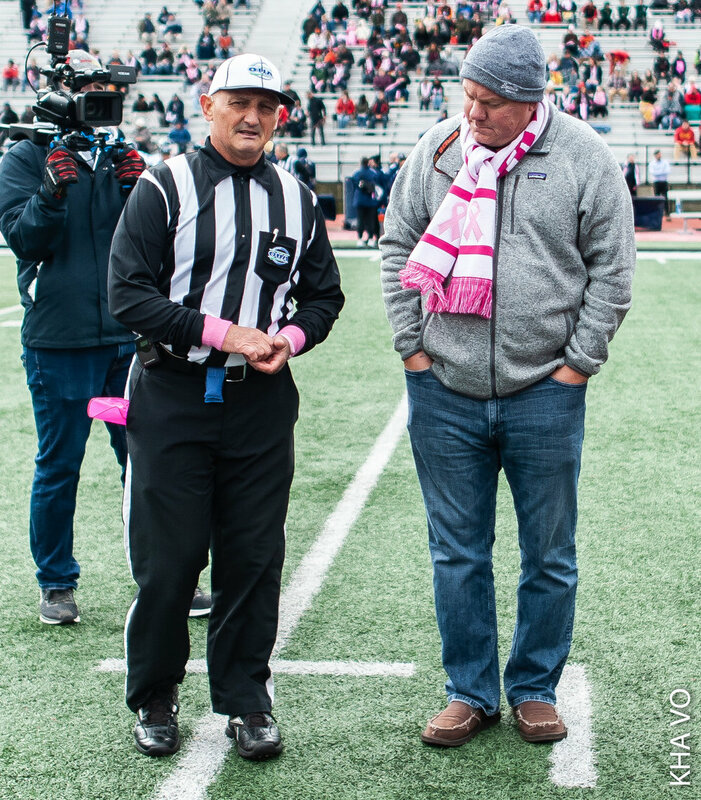 Just before kick-off of the highly anticipated annual Think Pink game, we were delighted to welcome former quarterback, Mike Shoemaker, to centre field as our Honourary Captain. Mike is a member of the University of Guelph Class of 1989 as well as the Guelph Gryphon Athletics Hall of Fame Induction Class of 2003. He has a collection of prestigious football titles including, 2-time OUA First Teams All-Star, 2-time CIAU All-Canadian, and OUA conference MVP in 1988 and 1989. He also won the university’s Don Cameron award in 1987 and Male Athlete of the Year in 1988. Thank you for joining us for the coin toss, Mike! It was great to have you back on Gryphon turf for such a great game. Having just been inducted to the Guelph Gryphon Athletics Hall of Fame the night before, it only seemed fitting to have Dave as our Honourary Captain for the Homecoming game. Dave wore the Gryphon jersey as a wide receiver from 1990-1993. He earned the titles of OUAA All-Star ‘91, ‘92, and ‘93, CIAU All-Canadian in ‘92 and ‘93, a Yates Cup winner in ‘92, UofG Male Athlete of the Year ‘93, as well as a member of the 1990’s Team of the Decade. His achievements with the Gryphons led him to be a Toronto Argonauts (CFL) draft pick in 1994. It truly was an honour to have him back on the field. Rob was a linebacker for 5 years with Gryphon Football before graduating in 1995 and being drafted to the Edmonton Eskimos (CFL) in the 1st round. In his time at Guelph, he was named Rookie of the Year in 1990, UofG Lineman of the Year in ‘92 and ‘93, Wildman Trophy winner in ‘93, and President’s Trophy winner in ‘94 and ‘95. He also collected multiple National and Conference honours, including becoming a Yates Cup champion in 1992. In 2012, he was inducted into the University of Guelph Hall of Fame, and we are thrilled that this year he was able to come back to the Alumni Stadium field and be our Honourary Captain for a game.